Alex Wilson joined the Studebaker Driver's Club (SDC) in 1968, and the seeds for a local chapter were planted. In 1970, another "Studebaker Nut" from Oklahoma City contacted Alex and others around the state, and the Oklahoma City Chapter of the SDC was formed. This one chapter seemed to satisfy the needs of those in Oklahoma with an interest in Studebakers - at least for a while. On the drives to and from Oklahoma City to attend meetings, Alex had the thoughts of a Tulsa or Northeastern Chapter stirring in his mind. On August 22, 1971, Alex answered a request in the Tulsa Daily World newspaper for information about Studebaker parts and the SDC National Club. As a result of his reply, several individuals contacted him for information and the desire for a local club chapter was born. Names of local SDC members were gathered from the National SDC charter and other sources. A letter of invitation was sent to prospective members to attend an organizational or get acquainted meeting with the Oklahoma City Club on September 19, 1971. Arrangements had been made for the Oklahoma City Club to caravan to Tulsa and have their regular meeting with the prospective Tulsa members. As a result of this meeting, the enthusiasm for a Tulsa club soared and the club was about to become a reality. Over the next few months activities were stepped up and recruiting was pursued with vigor. Bylaws were written and approved by the membership and an application was made for a Chapter Charter with the National SDC. The Chapter Charter was approved in July, 1972. "WE HAD A CLUB!" Three of the original charter members are still active in our club. Founded in 1962 by Harry Barnes, the Studebaker Drivers Club (SDC) is an international not for profit organization dedicated to the preservation and use of Studebaker vehicles. With more than 12,500 members worldwide, it is one of the largest single-marque old car clubs in the world. The annual Studebaker Drivers Club International Meets often attract two thousand or more members. Many members in Canada and the U.S. drive their Studebakers thousands of miles to attend these meets, held in a different location each year. Smaller zone meets are also held each year in various parts of the U.S. and Canada. S D C members own everything from horse-drawn Studebaker wagons to late model Avanti sports cars. The Studebaker Divers Club has more than 100 chapters around the world with substantial memberships in Australia, New Zealand, Holland, Norway, Sweden, and the United Kingdom. Most of the chapters sponsor local meets, publish newsletters and provide assistance in obtaining parts, service and technical assistance in the local area. In contrast with many old car associations, S D C has a Board of Directors with each board member representing a geographical zone. The National President, Vice President, Secretary and Treasurer are elected by the Board of Directors at the annual International Meet. In 1852, the Studebaker Brothers started building horse drawn buggies, carriages and wagons. Their wagons were a primary mode of transportation as the nation migrated westward. Studebaker carriages were used by US Presidents, including the carriage that took President and Mrs. Lincoln to the Ford Theater on that fateful night. 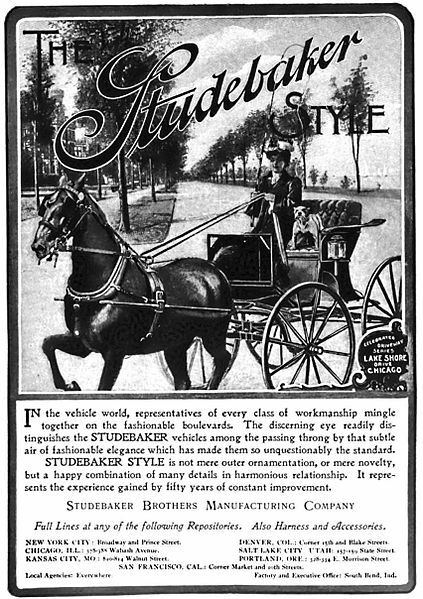 In 1902, Studebaker started building electric automobiles, but soon went to gasoline power. By 1915, Studebaker was building more than 45,000 cars annually. Wagon production also continued until 1919. In 1928, Studebaker acquired Pierce-Arrow. Unfortunately, by 1933 Studebaker had gone into temporary receivership, but was on the road to recovery in 1934. In 1939, Studebaker introduced the Champion, a new economy model designed by the soon to be famous Raymond Loewy studio. During WWII, Studebaker produced trucks and radial engines for aircraft, including the B-17. After the war, automobile and truck production resumed with a vengeance. In 1950 and 51, Studebaker offered their famed bullet-nose design. In 1953, the incredible new "Lowey coupe" was introduced. Bob Bourke, a member of the Raymond Loewy team, is credited with the innovative new design. During the last half of the fabulous fifties, Studebaker introduced their family of Hawks, merged with Packard in October 1954 and in 1959, responded to the growing demand for a more compact family car with the Lark. Studebaker once again turned the automotive design world upside down in 1963 with the unveiling of the Avanti. While the Avanti was universally acclaimed, Studebaker's days as a US company were numbered. Production ceased at the long-time South Bend, Indiana plant in December 1963, Studebaker production continued in Canada until March 1966. The Avanti Motor Company continued to build the Avanti II in South Bend until 1987 where production moved to Youngstown, Ohio until 1991. Production was moved to Cancun, Mexico where the last Avanti rolled off the assembly line with a v6 Roush race motor in 2007.